Submitting claims through the MCIT online member portal is simple. See the instructions below. Below are instructions on how to submit a claim to MCIT using its online system. The instructions are for any type of claim: workers’ compensation (First Report of Injury), property, auto, liability, data compromise/cyber-attack and bond. MCIT requires that all claims be submitted online through the member portal. Note: The system automatically logs you out after 60 minutes. Your work will not be saved. You cannot log in later and complete the form. The system does not save partially completed forms. Internet Explorer shows a “Save Draft” button; do not use, it does not function. Download a PDF of the following instructions. On the home page, select Submit a Claim (center under slides). Step 3: The red square shows where to access the forms to submit property and liability claims. The green square shows where to access the form to submit a workers’ compensation claim (a.k.a. First Report of Injury). You are now at the member portal dashboard, containing all claim forms, in addition to other task options. If you are authorized to submit claims for more than one MCIT member, you first need to select the correct member. Then you will go to the claim forms page. Step 4: Hovering over a claim type provides more information about when to select that form. For assistance in selecting the appropriate form, hover your mouse over each button for information. 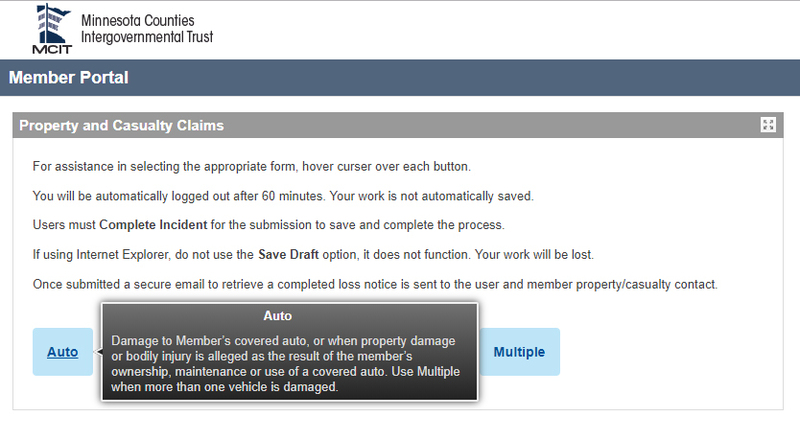 Select “Multiple” when more than one property/casualty (liability) claim arises from a single event. This allows you to report the event and the general information once and the same information will automatically populate multiple claim forms. Required fields have a red asterisk (*). These fields must be completed or you cannot submit the claim. At the bottom of the form, there are two information boxes: first is Optional Supporting Documentation and explains the types of documents you can submit. Move to the second box and select Save and Continue. The page refreshes. Scroll to the bottom and select Upload File. Select the files by dragging and dropping or adding them from your system directory. The bottom of the following screen lists the documents that have been uploaded. 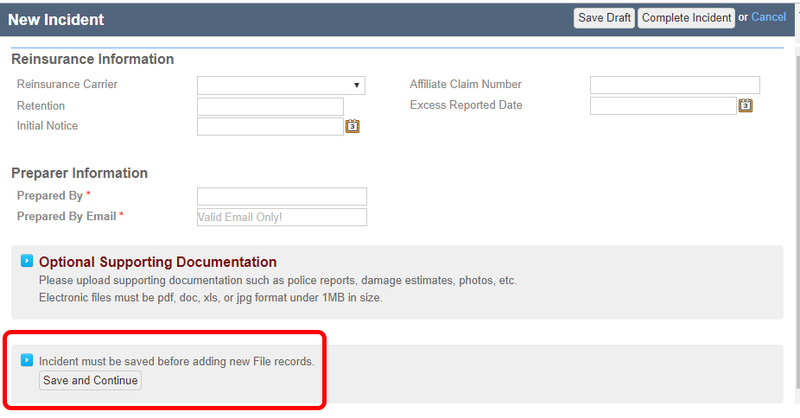 Step 7: Once you are done entering information and uploading documents, you must click “Complete Incident” button in the top right of the claim form page to submit the claim. 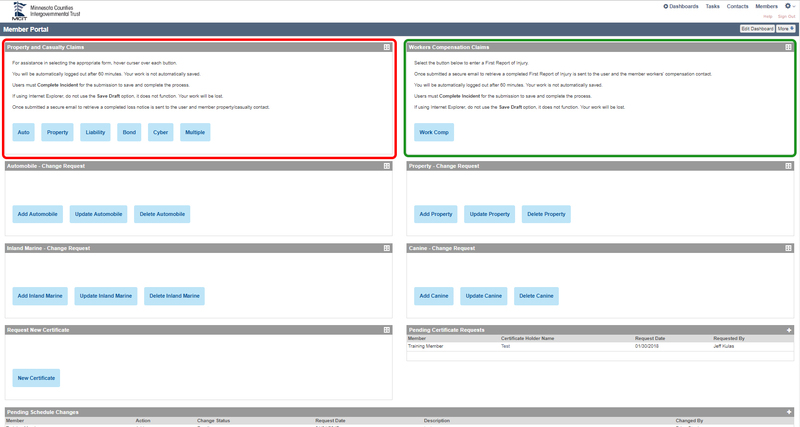 Select Complete Incident located at the top right to submit the form and supporting documents. If you do not click “Complete Incident,” the claim is not submitted to MCIT nor is it saved. You will get a message indicating that your claim has been sent to MCIT and that MCIT will contact you about this incident. You and the member workers’ compensation or property/casualty contact receive a secure e-mail that allows you to login securely to retrieve the form. This e-mail has “Secure Email from MCIT” in the subject line. Open the message and select the link Click here to retrieve your secure email. You then login to the Origami Risk system, this is MCIT’s approved vendor. If you have not created a login in the secure e-mail system, do so. If you have a login but have forgotten your password, select “Forgot your password” from the bottom left of the form. After logging in, your e-mail opens, and a PDF of the claim you submitted is attached.